Minor damage or a car that has been totalled in a car accident; we’ll buy the car. We are your car buyers in Melbourne, Victoria, that pays cash for damaged cars & trucks, buying all makes & conditions of cars. When you sell your damaged car to us, you get more than cash paid on the spot. Damaged Car Removals Melbourne wide, Get your damaged car sold with no hassles. Call Cash for Cars VIC for an instant quote. We pay top dollars, putting up to $9,999 cash in the hands of our customers. When we are your damaged car buyer, you are assured quality services, always! To get our damaged car removals service, call 0423 199 008. Cash for Cars VIC is a top rated car removal company in Melbourne that has years of experience in the industry and a reputation of services that are second to none. Cash for Cars VIC removes damaged cars regardless of the running condition of the car. When a quote is accepted, we send our tow truck driver to remove the car or truck at a time that is convenient for our customers. With us, you schedule the time of your removal, and we arrive on-time with our tow truck, loading and removing the car once all paperwork is signed and the cash value for the car is put into your hand. Our towing services for damaged cars is always free to our customers selling their cars to us. 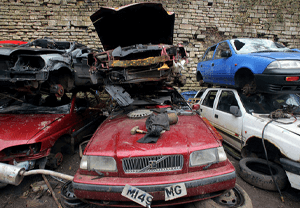 At Cash for Cars VIC, we provide our customers with free car wrecking and Recycling. We have the facilities fully equipped with the proper tools and equipment for our customers to get the best value from their cars. Our team of expert wreckers and recyclers get right to work dismantling the cars, pulling parts to recondition, and leaving the rest to recycle. Our procedures are considered green car recycling, leaving our customers with instant cash and an eco-friendly disposal. Courteous services – Our services include the professionalism of our technicians that assure a wonderful selling experience handled in the most courteous manner. Instant cash payments – We are car buyers that do not make our customers wait on their payments for their cars and trucks. We make on the spot payments at the time our removal technicians arrive to remove their cars. Free Damaged Car Removals Melbourne wide – Get a free damaged car removal with every car you sell to Cash for Cars VIC. Free wrecking & recycling – With our eco-friendly wrecking & recycling our customers get the best value for their cars and don’t pollute the environment with unnecessary contaminates from the cars’ disposals. Free paperwork – We provide all legal paperwork. We are a car removal company that wants to buy your damaged car, putting top dollars in your hands. Contact us over the phone or complete our “Get a Quote” online form at the top right of this page. We only require the make, model, year, and a complete description of your car or truck to provide a quote.